We are a leading Manufacturer of coated paper cups, disposable paper cup, pepsi paper cup, plain paper cup, cold drink paper cup and hot drink paper cup from Mumbai, India. An advanced version of Coated Paper Cup with both double and single coated sides is offered by us at market leading rates. These double side coated paper cups are best suited to serve both cold and hot drinks such as coffee, Pepsi, Coca Cola and many more. Our experts design these products in compliance with the defined parameters of quality, by ensuring zero-defect in them. Our state-of-the-art infrastructure always plays the prominent role in fulfilling the bulk customer’s demands in best possible manner. Price range starts from 0.32 Rs and will vary depending upon the colour size and paper material . 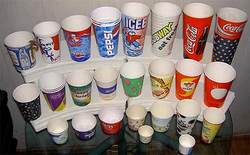 An advanced version of pepsi Paper Cup with both double and single coated sides is offered by us at market leading rates. These double side coated paper cups are best suited to serve both cold and hot drinks such as coffee, Pepsi, Coca Cola and many more. Our experts design these products in compliance with the defined parameters of quality, by ensuring zero-defect in them. Our state-of-the-art infrastructure always plays the prominent role in fulfilling the bulk customer’s demands in best possible manner. Enriched by our vast industrial experience in this business, we are involved in offering an enormous quality range of Disposable Paper Cup. We specialize in offering Corrugated Paper Cup. Looking for Paper Cups ?